Every Mutsy product comes with its own manual. Read this manual carefully and keep it for reference. Please note that not following the instructions in the manual could endanger the personal safety of your child. Don’t have your manual at hand? No problem, you can download it here. Watch the Mutsy demo videos here. Do you still have a question about a Mutsy product? How can I adjust the seat? Adjusting the back: for moving the back rest backwards push the adjustment button at the back of the seat on both sides and move the adjustment button backwards until the desired position is reached. If you want to move the back rest forwards, press the adjustment button at the back of the seat on both sides and move the adjustment button forwards. Adjusting the foot rest: pull both plastic handles below the foot rest towards you while you are putting the seat in the desired position. How to fold and unfold my Mutsy Spider? Unfolding the frame: detach the frame closer at the basket. Lift the Spider by the handle, holding the front wheel to the ground. Move the push bar up until you hear a click. Make sure the plastic handle is in its niche. Now move the seat down until you hear a click. When you move the metal clasps at the back of the push bar downwards, you can put the bar in every desired height position. Don’t forget to close the clasps to lock the push bar at its desired height. Put the foot rest down. How do I install/remove the wheels? Installing the back wheels on the Spider: place the plastic wheel axis in the plastic tube. The plastic tab at the end of the axis locks the wheel when it’s fully in place. Installing the front wheels of the Spider: place the opening of the front wheel mounting part over the vertical tube end at the front of the Spider frame. The swivel block part is now facing upwards. When the front wheel part is fully over the tube end, it will fasten automatically with a click. Removing the Spider back wheels: push the plastic tab at the end of the wheel axis. Pull the wheel out. Removing the front wheels of the Spider: click the plastic tab on the bottom of the front wheel mount out. The mount is unlocked and can be taken off the vertical axis. Do I need to oil/lubricate the moving parts and wheels? Never use oil to lubricate the wheels. You can use an acid-free Vaseline to keep the wheels rolling smoothly. Use a Teflon spray to lubricate other moving parts. Rub it in with a soft cloth. Make sure the locking mechanism and the swivel mechanism are treated with Teflon spray regularly. Also treat the areas that make contact with the locking and swivel mechanisms. How should I clean the lining? Do not wash the lining in the washing machine or tumble dry it. If stains occur, treat them with a mild liquid soap (no bleach!). Always treat the complete area at once. When the fabric is wet, stretch it out as far as possible and leave to dry. May my Mutsy product become wet from rain or snow? Mutsy fabrics are chosen and tested to be water resistant, but when the product gets really soaked, water can leave traces on the fabric. We would advise you to always use the dedicated rain covers to prevent this from happening. How much weight can the shopping basket carry? The Spider basket at the base of the frame can carry a weight of 7.7 Lbs. How old must my child be in order to use the seat? How much weight can it carry? 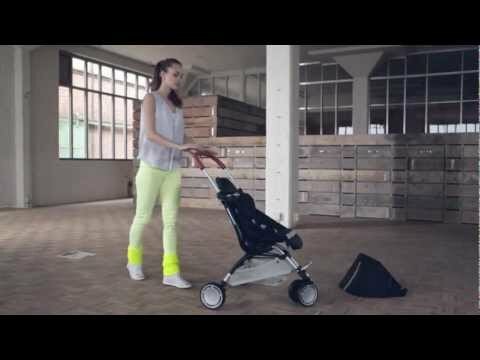 The seat is suitable for children from 6 months and up to 33.5 Lbs. Which car seats are compatible with the Mutsy Spider? How do I attach the car seat adapters? Fold down the side panels of the seat. Open the adapters with the slider and place the adapters over the upper frame. Place the adapter marked R on the right side and the one marked L on the left side in the mounting elements.